Kone supplied a wide range of elevators for the Doha Tower in Qatar. Kone, a global leader in the elevator and escalator industry, has set its sights on Qatar’s booming market with ambitious growth plans in place. In line with these targets and its status as the preferred maintenance partner, the company will soon be shifting to a bigger office in Doha. The company expects growth in opportunities related to stadiums, hotels and mixed-use segments, says an official. “Kone Qatar is involved in mega infrastructure projects that are due for completion prior to the 2022 Fifa World Cup,” says Mark Bayyari, managing director, Kone Qatar and Bahrain. “Currently, we are executing several projects in Qatar. These include residential, office, retail and infrastructure buildings ranging from low to high rise. Kone is committed to completing these projects as per the agreed schedule with the main contractors,” he adds. For these projects, the company has offered Kone Monospace elevators and extra heavy-duty escalators including a unique cabin design with premium finishes and state-of-the-art technology. Furthermore, Bayyari says one of these mega project is backed by a 20-year maintenance contract. 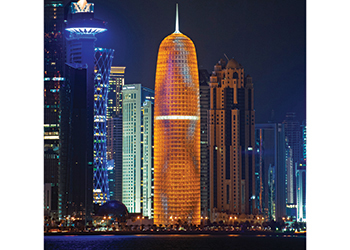 A major project that Kone completed in 2012 was the Doha Tower, officially called Doha High Rise, where Kone installed the region’s first high-speed panoramic elevators, travelling at 6 m per second. For the 46-storey tower, Kone supplied 17 MiniSpace elevators, three MonoSpace Special elevators, one TranSys freight elevator, five hydraulic elevators, Kone Polaris Destination Control System, Kone E-Link monitoring system and Kone Care Maintenance Service. 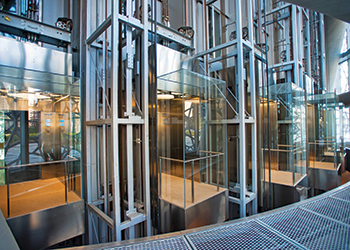 Kone provides innovative and eco-efficient solutions for elevators, escalators and automatic doors as well as solutions for modernisation and maintenance. Its business in Qatar saw significant growth in 2015 due to mega infrastructure projects and is expected to continue to grow in 2016. Doha Tower has the region’s first high-speed panoramic elevators. Commenting on Qatar’s market, Bayyari says: “The construction market saw significant growth in 2015 due to the award of mega infrastructure projects. The market, which is expected to grow steadily in 2016, will pick up from 2017 due to the 2022 Fifa World Cup,” says Bayyari. Kone, he says, has plans to grow faster than the market and continue to be the preferred maintenance partner in the market. “We will continue to grow in both the new equipment and service business with a special focus on modernisation projects,” Bayyari adds. Kone operates through more than 1,000 offices in over 60 countries around the world, and has seven global production sites located in its main markets, as well as eight global research and development (R&D) centres. It also has authorised distributors in close to 80 countries. In 2015, Kone registered net sales of €8.6 billion ($9.64 billion) and close to 50,000 employees worldwide by the year-end. In Qatar, it currently has more than 300 employees with plans to expand its strength to cross 500 employees in the near future to accommodate its planned growth. “We are planning to shift to a bigger head office in Doha by mid-2016,” says Bayyari. The office in Qatar was opened in 2006. Facilities in Doha include employee accommodations located at different areas as well as a warehouse and a training centre. Kone has been operating in the Middle East since 1993 when the regional head office was opened in Dubai, UAE. Other Kone locations in the Middle East include Abu Dhabi and Al Ain in the UAE, Bahrain, Oman, Egypt and Jeddah, Abha, Dammam, Makkah, Madinah and Riyadh in Saudi Arabia. Kone also operates through distributors and joint ventures in Iraq, Iran, Jordan, Kuwait, Lebanon, Pakistan, Syria and Yemen. In 2015, Kone was ranked 48th on the list of the world’s top 100 most innovative companies by the business magazine Forbes for the fifth year in a row. New innovations such as the Kone Turnstile 100 was awarded with iF Design Award and the Red Dot Award: Product Design 2015. The turnstile sets a new standard for innovative and timeless visual design and functionality, while improving building security, guidance and convenience. Last year, Kone initiated the first phases of installation work on the construction site of the Jeddah Tower (previously known as Kingdom Tower) in Jeddah, Saudi Arabia, which will be the world’s tallest building at a height of more than 1 km once completed in 2018. “In total, Kone will manufacture and install 57 elevators and eight escalators at Jeddah Tower. Kone DoubleDeck elevators, travelling at a speed of over 10 m per second, will reach the highest habitable floor of the world in 52 seconds. In addition, the high-speed elevators will rise 660 m to the observation deck, making it the world’s highest elevator rise. “With the use of Kone UltraRope, which is one-third the weight of traditional ropes, DoubleDeck elevators will be able to fit with normal machines, a huge advantage that will enhance the sustainability of the Jeddah Tower by consuming much less power,” says Bayyari. Meanwhile worldwide, Kone recently won projects including China Zun, Beijing’s tallest building to be when completed in 2018; the new law courts complex in Paris, France; 360 Collins Street, one of most prestigious office buildings in Melbourne, Australia; the iconic Sky Tower in Auckland, New Zealand; and luxury cruise ships Oasis Four by Royal Caribbean Cruise Line and MSC Meraviglia by STX France.